The Niles City Schools is proud to offer breakfast and lunch programs. These meals are planned to meet the guidelines established under the child nutrition program of the United States Department of Agriculture. 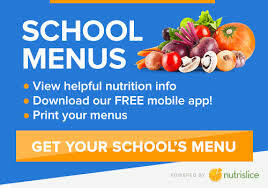 Menus are featured in the local newspapers, are sent home each month with your child on the back of their monthly school newsletter, and are also available in several locations here on our website. Applications for the Free and Reduced Breakfast and Lunch Program are available in all school offices. Forms may be obtained throughout the school year as the need arises. Completed free and reduced applications are to be returned to the principal’s office. They will be reviewed by the Food Service Director and a determination made as to eligibility. Applicants will be notified as soon as possible as to whether or not they qualify for free or reduced breakfast and lunches. All applications are kept confidential and there is no identifying factor involved. Students who qualify for the program must follow the established rules and regulations. If your child is approved for Free and Reduced breakfast and lunch it is from the day your application is approved. If there are prior existing charges to your childs account, you are responsible for those charges. Students who are eligible for free or reduced price lunches are also eligible for free or reduced breakfasts. Other students may also purchase breakfast on a daily basis. Reduced lunch is $0.40 daily or $2.00 weekly. Reduced breakfast is $0.30 daily. Several ala carte items are available daily at the High School and Middle School (prices vary). Click here to for instructions on how to apply.